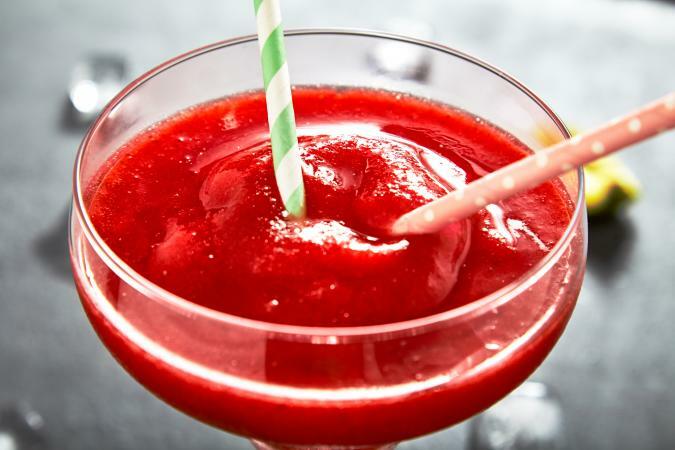 A strawberry daiquiri on a summer day is essential to many backyard parties. On a hot day or when you have numerous guests waiting for their beverage, a blender can help get your drinks ready to drink as quickly as necessary. Making a daiquiri in a blender doesn't require a lot of time, or a lot of expertise. Make your daiquiri stand out by using fresh, quality ingredients and blending them up on demand. This recipe makes four, large daiquiris. Pulse the blender a few times to begin to break up the ice. If your blender has an "ice" option, use it when pulsing until the ice has been reduced to small pieces. Set the blender to "high", keeping it on the "ice" or "frozen" setting. Making a daiquiri in a blender is not difficult, but the process can be improved or changed through a few substitutions and tips. Nothing disrupts a smooth drink like a wedge of unblended ice getting stuck to the bottom of a straw. You can help eliminate these ice floes by listening to the sound your blender makes as it nears the end of the process. If your blender is still hitting unblended chunks of ice, there will be a soft clunking sound at regular intervals. Stop blending when you can no longer detect the sound. Not everyone likes a very thick daiquiri, which is what blending with ice will get you. 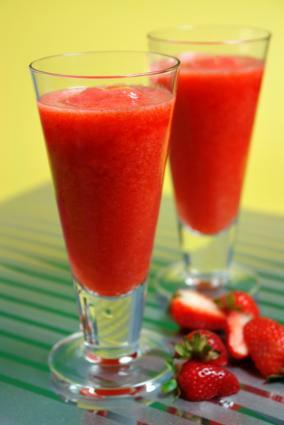 For a fruitier, yet thinner drink, use 3 cups of frozen strawberry pieces in place of the fresh strawberries and ice. Blend in the same manner, pulsing first to break up the frozen pieces before switching to high. Some type of citrus is crucial to a good daiquiri to highlight the flavor of the strawberries, but fresh juice isn't the only way to achieve that. Instead of using lime juice, try using one part Rose's Lime and one part Triple Sec to equal the 1/2 cup of lime juice. Your daiquiri will be just as flavorful, but with a smooth and complex background. Have your blender ready to go at all times to ensure a steady supply of fresh, sweet daiquiris. In no time at all, you'll be a blending pro.